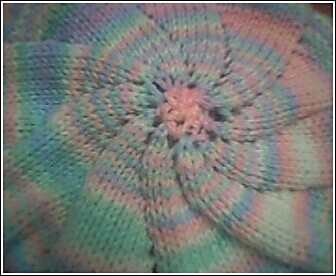 with the help of several knitting friends, i -finally- got my friend's baby blanket started. 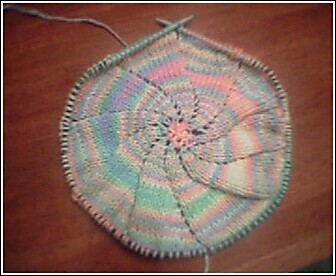 i used emily ocker's circular cast on to get started. that helped make it easier to work the small circumference at the beginning. of course, this gets easier to work as the fabric gets bigger, and now, it's almost mindless. Oooh! Did I read right? It says it can be used for toe up socks! I'm being tempted again by fate... Thanks for the link. Ooooh your blanket is looking nice, I like the colour.